The building is on fire, a car has crashed into it, and thieves are trying to break in! Police officers, fire fighters, and paramedics are all working hard as the news crew records the action. 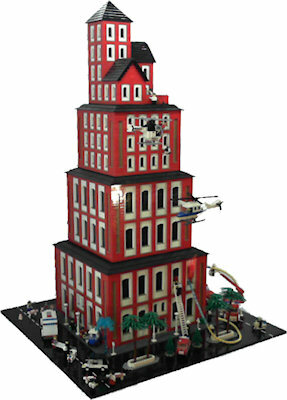 This building appeared at Supertrain 2013 as part of the Southern Alberta Lego Users Group's display. 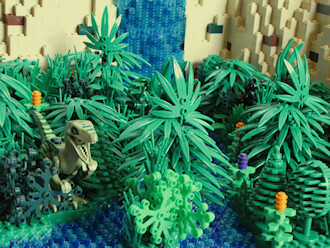 Over 30 dinosaurs appear in this model, along with landscape elements like a volcano, jungle, waterfall and canyon. 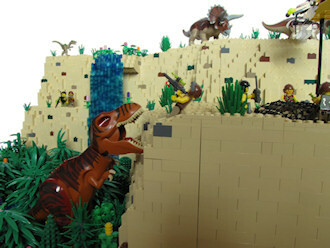 The model also features whimsical elements like people being chased by dinosaurs, and a helicopter hovering overhead as people examine a captured dinosaur. The model was displayed at approximately half a dozen venues around Calgary in late 2012 and early 2013. 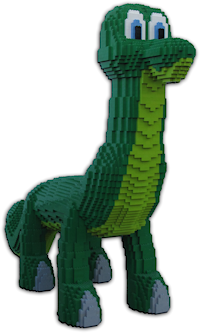 This model received the People's Choice Award at Brick Roundup 2013. 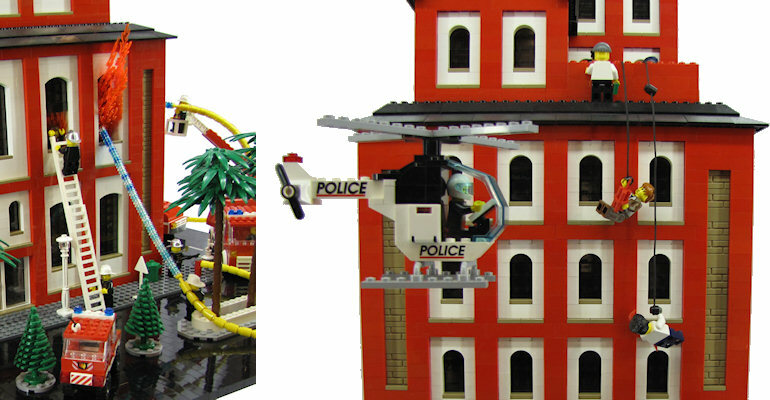 It also received the Fan Choice Award at the 2013 Silver Springs and Scenic Acres LEGO Building Competition in Calgary. Additional photographs can be found here. This model was supported by Calgary 2012, the City of Calgary, and the Cultural Capital of Canada Program through the Grassroots Inspired Grants Program. This model of WestJet's #100 Boeing 737 NG aircraft was on display as the arrival of the new aircraft was celebrated at the WestJet campus on December 7, 2012. This 1000 piece note is issued by the Plastic Reserve Bank. 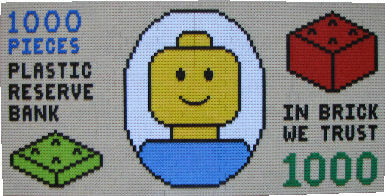 In Brick We Trust! 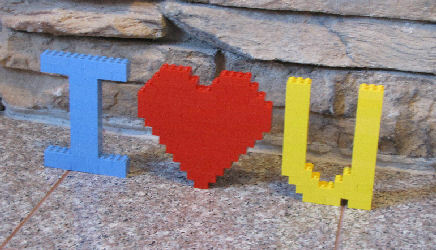 You can say "I Love You" with Lego! Want to build your own? Complete instructions are available here. 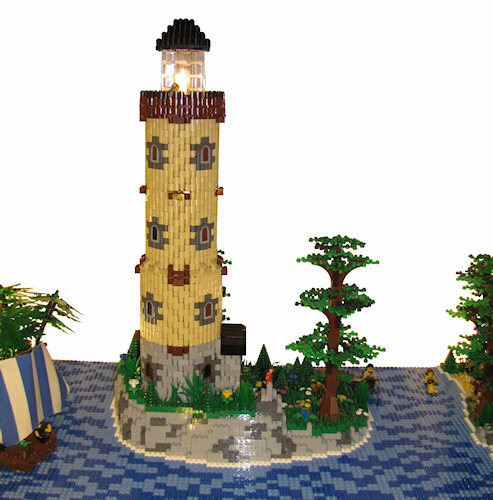 This lighthouse was constructed using 1x2 log bricks and 1x1 round bricks. A circular profile was achieved by exploiting the flexibility between these pieces. 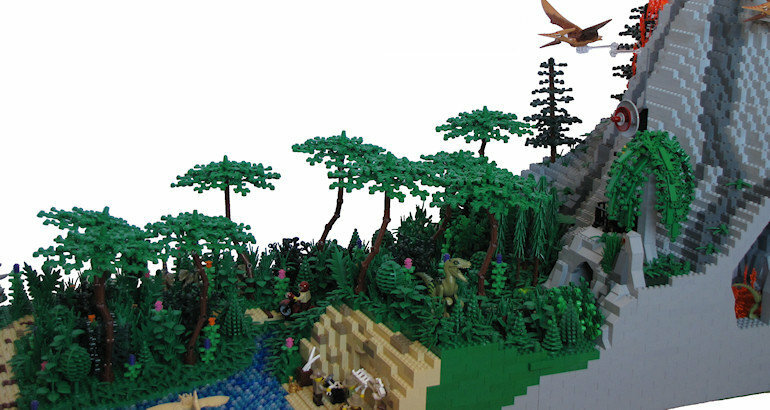 This model received the Fan Choice Award, as voted by the attendees at the 2012 Silver Springs and Scenic Acres LEGO Building Competition in Calgary. Last modified: March 24, 2019 3:04:23 AM UTC.